THE FACTS – Defender Rosario Tuyuc has received several anonymous e-mails in which her dignity is attacked with defamatory remarks, misogynous comments, and threats of a public smear campaign against her. Rosario Tuyuc is an active member of the Oxlajuj Noj Council and the Adimar Association, who struggles for women’s access to the land and engages in the care of forests and water. Displaced within her country by the armed conflict, she participated in the International Genocide Tribunal and has worked for the rights of women and youth with the Comalapa Youth Coalition. These attacks have taken place in the context of the hostility of the Guatemalan government towards human rights work and to the organizations and persons who participate in it, as previously denounced by international Human Rights entities of the UN and the IACHR. We of IM-Defensoras extend our solidarity to Rosario Tuyuc and repudiate the attacks and misogynous threats to which she has been subjected. These not only endanger her moral integrity, but also disrupt her basic human rights work. We demand guarantees for the defender’s physical and moral integrity and call on the international community to express solidarity with her. 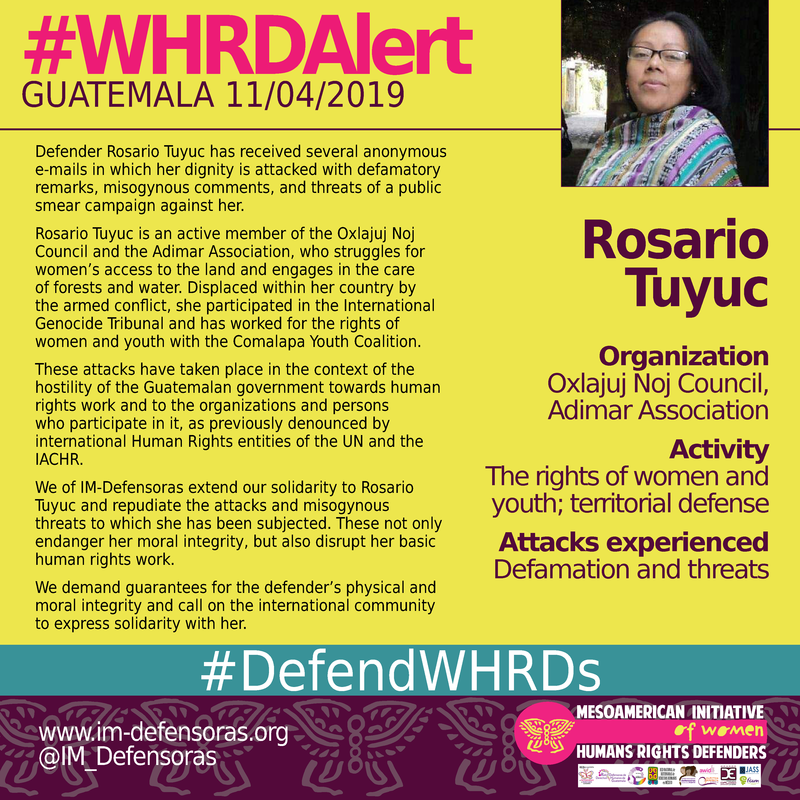 #WHRDAlert GUATEMALA / Defamation and threats against Rosario Tuyuc, defender of territory and the rights of women and youth.